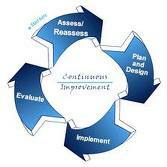 Kaizen is a Japanese term which means continuous improvement . Kaizen has been religiously followed by major automobile and other manufacturing industry. Beauty of Kaizen concepts lies in bottom to top approach where people involved in process contributes to improvement rather than consultants hired from outside and they who with their experience implement ideas for improvement . Changes suggested could be small in nature but can contribute in improving process in many ways . Bakeries can implement Kaizen concepts to increase productivity , reduce wastage , save cost in fuel , reduce procurement cost and save cost in other area of manufacturing . Companies can hire Kaizen experts to monitors project taken and familiarising employees to key concepts of Kaizen ( 5s , gemba , muda , poka yoke , kanban etc) . Cross functional teams comprising of 4-5 people ( including workers , frontline supervisors ) can be created for projects where improvement can done . Kaizen projects are written with clear cut objectives with time frame ( few days to few months ) to achieve with the results . Investment required are calculated and mentioned , one should take small projects which require minimum cost and time during kaizen workshops . These cross functional team are then allowed to brain storm the ideas for improvement and to list support from the management . The management then allocate some funds for these projects and decisions are taken by the Kaizen team on the spot . Once the stipulated time is over ( 5- 6 days workshop would be good enough ) Groups then declare their achievements and facts . Improvements which are achieved are then standardised and included in the system . This can be done on a regular basis which would impart creativity and sense of achievement in employees . Companies can start a news magazine show casing these results and giving recognition to people who have done these projects . Kaizen awards could also be constituted to encourage employees to come forward with innovative ideas . 5s of good housekeeping or Kaizen Concepts is the most popular among the list enumerated here. I agree that people in the company knows better on improving their work since they are involve in the process rather than consultants. If bakeries would apply this, aside from following the state’s requirements on food safety, then there’ll be fewer problems about contamination.